I make yogurt at least once a week. My kids love homemade yogurt plus we use it in smoothies and to make soaked granola. 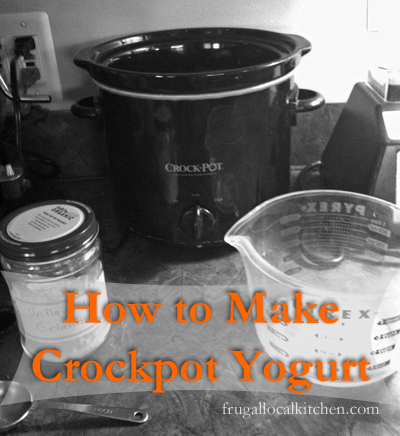 A few years ago, I invested in 2 pieces of equipment which made the entire yogurt making process easier – a 2.5 quart Crockpot and the Yogourmet Yogurt Maker with an extra batch jar . Before this, I constantly burned the milk when heating it, because of course, I couldn’t stand there and watch the milk heat up. I put together a video showing how I make the yogurt and included the recipe below the video. Please let me know in the comments if anything isn’t clear in the video. I’ve found that using the crockpot gives me a little leeway if I can’t put the warmed milk into the yogurt maker immediately after it cools for 3 hours. 1½ cups of hot water. 1. Put the whole milk and unflavored gelatin into the crockpot and turn on low for 2.5 hours. 2. Turn off the crockpot and unplug. Allow the milk to cool in the crockpot with the lid on for 3 hours. 3. About 10 minutes before the cooling period is finished, set up the Yogourmet yogurt maker on the counter in a place where it can remain undisturbed for 4 to 6 hours. 4. Warm up the water for the yogurt maker. I warm mine in the microwave on the Express setting for 2 minutes. You can also warm it on the stove to almost boiling. The yogurt maker will keep the water warm during the incubation time. When the water is ready, put it in the yogurt maker. 5. In the batch jar, put the yogurt starter along with ½ cup of the warmed milk and whisk together. Add in the remaining warmed milk and whisk thoroughly. 6. After securing the lid on the batch jar, place it in the yogurt maker. The water level should rise up to be above the milk inside the batch jar. Place the yogurt maker cover on top, and let the yogurt incubate for 4 to 6 hours. 7. When the incubation period is finished, place the yogurt batch jar in the fridge to cool. It will need about 12 hours to cool. If the yogurt is a little runny, add more unflavored gelatin. If it's too solid at the bottom, then you didn't whisk the warmed milk long enough, and the gelatin settled in the bottom. If you use raw milk for this method, you'll find specks of cream at the top of the final yogurt product. We use a yogurt maker for our yogurts – but, it never occurred to me to use unflavored gelatin to make it less runny. That’s the problem with using lower-fat milks I guess. Total genius, thank you! I have the same issue with whole milk. The gelatin helps a lot though it’s not the same consistency as store-bought yogurt. I had no idea you could make yogurt in a crock pot. Absolutely no clue…. It’s great for those of who, ahem, multitask. I so want to try making yogurt. So i am book marking this. Nope, I never have. I can ask elsewhere and see if anyone else has. I’ll let you know. Can you use coconut milk? I thought I read on your blog that you couldn’t for your daughter, but wanted to make sure. I still need to dust off my yogurt maker about which I made a resolution in January. I’ll have to give this strategy a try too. Yogurt in the crockpot? Now that is just pure awesomeness! I need to try this sometime soon! I never knew you could make homemade yogurt. You are so resourceful. Well that si something I would never have thought of using a crock pot for! Thanks for taking the time to make a video too – you made it look really easy.